Whenever a critical facility is being designed, it’s imperative that a great deal of attention is given to the grounding system in order to reduce the chances of overcharging, to isolate faults and to upgrade the uptime. The experts of Data Center Journal are here to recommend several different effective grounding methods, including corner grounded delta, low-resistance grounded and solid grounded. The main reason a mission critical facility might use the low-resistance grounding method is to lower the rate of damage that can result from the intense currents that flow during ground faults. This method can be utilized on low voltage systems as well as medium voltage systems. The overall magnitude of the fault current is quite large, which means that the source has to be immediately disconnected. Because of this, the low-resistance grounding method might not be a viable option for mission critical applications. The way the solid grounded method works is it connects the system neutral in a direct path to the ground, which helps in making sure that the neutral voltage and ground are balanced. With a grounded neutral, the individual lines of neutral voltage are locked with a specific reference to ground. The advantage of the locked reference is that it keeps phase-to-ground overvoltages from taking place. One word of caution with the location of neutral-to-ground bond points is that not paying close attention to those points can result in an interruption in the ground fault sensing systems. Because of the substantial amount of electricity that can be released during a ground fault with a solid grounded system, the source of the electricity has to be disconnected as soon as a ground fault is detected. For a professional suggestion about which grounding method is the best fit for your mission critical facility, get in touch with us here at Titan Power Inc. 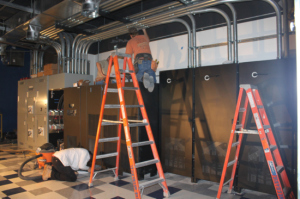 This entry was posted in Data Center Construction, Mission Critical Industry. Bookmark the permalink.